Few racers can boast of a career in which they are riding against not just the children but the grandchildren of their former competitors, but John Parker is one. One of the winningest riders in Canadian dirt track history, he has been twisting the throttle for 47 years and counting. With five No. 1 plates, 21 national championships and 32 provincial championships, he’s a bona fide living legend in Canadian racing. John’s also a perennial winner on his adopted home track at Medina, N.Y.
John spends his work days in the motorcycle service department of a BMW dealership and his evenings and weekends building race bikes, teaching dirt track techniques to aspiring young riders and watching for the twitch of the starter’s flag to gain his inevitable holeshot into the first corner. He’s widely known as a master at all these disciplines and remains committed to putting back into the sport as much as he’s gained from it since he was eight years old. John learned the love of motorsports from his father, also named John, who had raced cars in his native England. Young John started in a go-kart and progressed to a Rupp minibike before his father bought a pair of 50 cc Honda Mini-Trails so they could ride together. His first competitive events were with the Minibike Club of Canada, but as John grew he got involved with the Steel City Riders Club through his dad’s friendship with Ray Boasman. Schoolboy motocross and ice races with Steel City came next and John soon ventured across the border into New York State through his friendship with another up and coming rider, Norm Carr. His enjoyment of sideways action on the ice led John to try flat track racing, though until the age of 14 he devoted his summers to motocross. The highlight of 1975 was beating expert riders Peter Grant and Doug Sehl at Welland while still a CMA senior. In 1976 John turned expert and won all three class championships at Welland aboard his F Manley supported Kawasaki’s. John made the jump to the 750 class in ’77 when he gained his AMA pro licence and bought a Harley racer with the help of local dealer Chief’s Custom Cycle. Late that year, though, his family’s Kawasaki business was sold and the help he’d been receiving dried up. John quit school and devoted himself to learning the craft of becoming a professional motorcycle racer. He struggled financially but continued to race and to learn until August 1979 when a serious crash on his 750 Triumph at a pro race in Hamburg, N.Y., left him with a badly broken left arm. John still found the means to race, but as a passenger to Blake Pierce on an 800 cc sidecar ice racer. The team won two national ice racing championships. It was a dry spell for John but he had help from Doug Sehl with installation of a Yamaha engine in his old Kawasaki dirt tracker which eventually led to some solid finishes. He credits Doug Sehl with getting him started on a 35-year career as a fabricator and builder of race bikes. 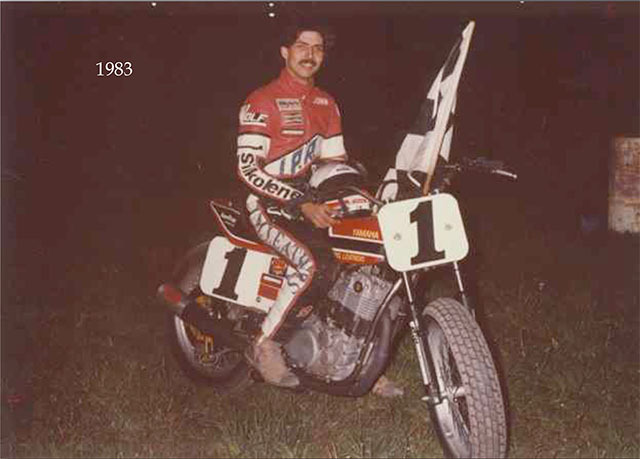 An important boost came in 1980 when he was offered a job by Larry Bastedo and Jim Kelly at BK Motorcycles and started on the path to become a licensed motorcycle mechanic, this relationship also led to his first two No.1 plates in 1982 and 1983. He began attracting corporate sponsorship, first from Yamaha and then from Deeley Harley-Davidson which supported him on an XR750 for nine years. Nowadays he’s come full circle, with backing from Kawasaki. John’s previous day job was at Brutune Racing where for 12 years he built and modified road race and street bikes, as well as doing restorations. He took an interest in the Pikes Peak International Hill Climb and in 1996, ’97 and ’98 travelled to Colorado to compete in the Race to the Clouds. He also taught at youth dirt track schools through the ’90s and helped launch youth 50, 60 and 80 cc classes to encourage more young riders in CMA racing. The year 1999 brought spectacular success. John turned 40 and also became the most dominant rider in Canadian dirt track history by winning 12 nationals of which 10 were in a row. He won the CMA No. 1 plate in dirt track, received the White Memorial Trophy, was CMA national champion in the 600 cc and open expert class, CMA provincial champion in both classes and CMRC national champion in both classes. At the end of the season he also married his long-time fiancée Dawn Van Roon. Not that he has slowed down since. He was rider rep with the CMA for many years and sat on the board of directors in 2002-2003, his last No.1 plate came in 2003. He continued racing though dogged by injuries, especially a left knee injury—never a good thing for a short track racer, though he continues to excel at half-miles. John still races, builds engines for other competitors and supports young riders wherever he can. His nickname “the professor” is richly deserved.